Since he started leading in Iowa caucus polls, everyone has been writing about Ron Paul. Especially on libertarian and progressive blogs that I read, everyone is trying to figure out a way to square the parts they like about Ron Paul (anti-war, anti-US-imperialism, anti-Drug War) with the parts they don’t like. And they are specifically trying to figure out what to make over a series of newsletters with racist, homophobic, survivalist content that Ron Paul put out (but was likely ghost-written for him) in the early 1990s with some other prominent libertarians, including Murray Rothbard and Lew Rockwell. See Conor Friedersdorf, Andrew Sullivan, Coates, Jacob Levy and many others for summaries. What I find interesting is how much the discussion is focused on the past-ness of these newsletters. The newsletters stopped with their racist, bigoted and survivalist themes by the mid-1990s, and people are now debating how much they should reflect on both Ron Paul and libertarianism. Whatever the results of that debate, they represent an era now over – Dave Weigel and Julian Sanchez argued that “the best refutation of the old approach is not the absence of race-baiting rhetoric from its progenitors, but the success of the 2008 Ron Paul phenomenon.” But if you strip away the ugliness and just focus on the underlying political strategy and the coalition it hoped to bring into existence, the newsletters have not only survived but they form the core of the Tea Party movement. What Ron Paul actually thinks of these newsletters is a bit of a mysterious, as he often dodges hard questions about them. It is clear that Ron Paul has, to use Dara Lind’s phrase, a “Libertarianism for White Dudes” problem. The ability to discriminate against a minority at one’s lunch counter is the core of freedom, but a woman’s ability to have some autonomy over what is going on in her uterus is incidental to liberty (Ron Paul has declared Right-to-Life is “the most important issue of our age”). Take white middle-class people and explain to them how the safety net is ok for them because they are part of the virtuous hardworking backbone of the country, but it’s a dangerous creation because elite liberals will use it to create a mass, dangerous Other that don’t deserve to be part of it. It’s the same logic, amplified by the fact that the relevant white middle/working-class generation is starting to approach retirement. A demographic battle is being waged between an older, white middle-class generation versus everyone else, people who are especially young and more diverse. Flip open a copy of National Journal and see how political elites are currently trying to understand the polarization going on in the country as a battle between Brown Versus Gray and it gives you a sense. To the conservative movement that is doubling down on Gray, their strategy is that of the Ron Paul newsletter. Right now the major political struggles are over whether or not to scrap major parts of the Great Society for those younger than 55 while older folks take no hit. There’s a big debate about what to think of the unemployed, whether they are peculiarly unadaptable and untrained, and whether the government should run a higher-deficit and expand monetary policy to reduce unemployment. Though no groups are doing particularly well in this recession, the young, the poor and those with major debts are doing significantly worse – who are those that the Tea Party views as the underclass looking to loot them. Just like in the Ron Paul newsletter. 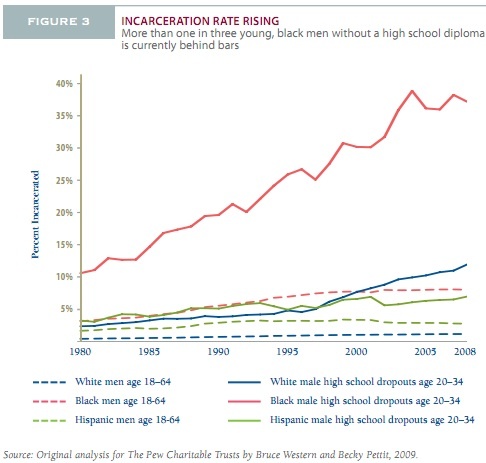 If you have ever been robbed by a black teen-aged male, you know how unbelievably fleet-footed they can be…Given the inefficiencies of what D.C. laughingly calls the `criminal justice system,’ I think we can safely assume that 95 percent of the black males in that city are semi-criminal or entirely criminal…We don’t think a child of 13 should be held responsible as a man of 23. That’s true for most people, but black males age 13 who have been raised on the streets and who have joined criminal gangs are as big, strong, tough, scary and culpable as any adult and should be treated as such. There’s a lot of explanations for why the newsletters stopped having its racists, homophobic and survivalist content. The newsletters were probably alienating more people than they were bringing in. The Oklahoma City bombing immediately changed the debate on survivalist groups. Perhaps they thought that the tent could be bigger. But we currently live in the aftermath of this strategy – if the conservative movement learned anything from 2010, it’s that being the party of the older, white vote that feels like they are losing the country to the looters can be a winning strategy,and it’ll form the outline of the 2012 strategy. As the “positive” mentions outnumber the negative mentions in both those links you provide (as counted by that site, however it does it), I’m not sure what point you have proved, but based on the way you try and minimize the racism in the RPSR, I think your point is that one little oopsie shouldn’t wipe out a whole lifetime of good work. Then there is a long track record of Paul speaking to groups like the CCC (why they don’t just call themselves the KKK I don’t know) and other white dominionist groups, and knowingly accepting large sums of money from them. There’s a reason he’s Stormfront’s favourite candidate. He deliberately dogwhistles to them, and they hear him. Whether he’s personally racist or just pandering to racists is pretty unimportant. Either he believes evil stuff or is evil enough to pander to evil people, I don’t see either as attractive. Maybe if I was a pregnant woman looking to find a physician to deliver my baby I would find the number of babies Paul has delivered important, but it doesn’t make him a good presidential candidate. Nobody said racists are incapable of any good deeds, but unrelated good deeds don’t make up for the racism when it comes to qualification for high public office. I wish I had a nickel for every blog post to our local newsrag about “undeserving” welfare recipients…I could go to Vegas and work the nickel slots for a month. These old goons are just so, so, frightened of being dis-empowered, it’s beyond pathetic – it’s now pathological. I mean, really, what kind of self-esteem requires such smug self-regard and willingness to kick someone weaker around? How can someone be so afraid of almost everyone else, yet grovel at the boots of those who are taking them to the pulper? Rothbard is a jew. Labor movement could use anti-immigration as as stepstone of controlling capitalism. This can go ALOT of ways. Just because nobody on the progressive side has brought this up to “old white dudes” is not a reflection of where this is going in the future. Eventually, the progressive movement may fracture, with one side embracing national socialism to combat excess free market doctrine. Obviously jewish Rothbard basically gave up. In the 60’s he was running with the New Left. Maybe young white dudes should start prophesizing about the future of the global capital owners dictatorship and the coming ‘free market totalitarian’ tryanny. When capital owners buy up cities and states. States rights is a scam you know. fwiw, I don’t think Paul is a racist at all. His record is pretty clear on that, but he has such low opinion of “tradtional” libertarian politics in terms of making it into power, he whores himself to the “faux-populism” that appeals itself to aging white men while keeping some cred with younger voters(even though his policies would cripple them). So you get the mythical “paleo” movement with its judeo-christianity strived cultural goals under the guise of biblical capitalism lol. That is why I feel the left will turn reactionary down the road. Maybe not tomorrow, but they may have no choice, especially when the federal government is liquidated and the economy contracts severely under a libertarian fantasy. LIbertarians underestimate how much government has supported the economy to historic growth since the 30’s. Once that support is gone, a whole generation of growth could be wipped out. Leaving a bunch of angry, hateful and revenge minded young white males open for business. would all be possible on a destroyed economy and isn’t possible now. Yeah, it may mean acting like a bunch of racist,incoherent aholes, but business is business. You gotta take advantage. If I was a old man then, I would be a little worried. While I recognize that there seems to be a consensus coalescing around that view, I am not aware of any good, specific reason to think that anyone other than Paul wrote his newsletters. I do not find his claim not to have written parts of them (parts he would now like to disown for obvious reasons) credible in the least. He could make his claim more credible by naming the person who did write these things, but I do not expect him to do that. Honest question: are you aware of any particular reason to think this stuff was written by anyone other than Paul himself? so…Ron Paul is a Republican? Did we not already know this? We can’t say that Ron Paul *invented* in the 1990s a Republican electoral strategy that was not only de riguer but already well analyzed by scholars–as for example in Omi and Winant’s “Racial Formation in the United States: From the 1960s to the 1980s,” published in 1986. Must be a slow news day. Now, actually, the interesting element would be the survivalists. That’s not something you see everyday. I guess you scrape the bottom of the barrel if you’re a libertarian. Or, maybe, survivalists are the only real libertarians, as opposed to the white collar opportunists who are positioned to take advantage of our neoliberal federal government policy who happen to read Reason magazine and think they’re hard scrabble “survivalists,” LOL, because they can’t recognize an actual welfare policy when they see it. Either way, I doubt we’ll think about it too much because we don’t already have an automatic script for that. Thank you so much for this post. It is good to hear someone finally say what has been obvious to me from the start. The real issue of Ron Paul’s newsletters isn’t so much the racism or the homophobia. It’s the nasty, punitive attitude toward “the Other.” The basic psychology underlying it is exactly the same psychology underlying calls to double GTMO, to torture Arab terrorist suspects, to crack down on illegal immigration, to tremble in fear of shariah law taking over and so forth. The targets have changed, nothing else. The real irony is that a lot of Paul’s followers are people thinking he is the one to move away from this nasty, punitive approach. As a long-time Ron Paul supporter, the Newsletters are not news to me but they are unfortunate for sure. Mike’s perspective in distinguishing anti-statism from anti-otherism is insightful. But this very distinction is what leads so many Ron Paul followers to believe he didn’t write those words. Many of us have read or listened to literally hundreds of hours of his speeches and have read countless pages of his writing, from early in his career to the present. In all of it, he speaks in terms of anti-statism, never anti-otherism. Thank you, Mike, for clarifying exactly the way these racist comments Paul has denied writing are so unlike the volumes and volumes of things he has in fact written. This post gave me sort of an “aha!” moment. I was thinking about why it was so familiar that people with privilege would be so afraid of those who have none, and it hit me. The argument (which you linked to not too long ago) that conservatism has always been this way, that it is about creating and defending centers of privilege, it all sort of clicked. It is consistent and appears at least on its face valid. The scary part that follows from that notion is that if any group can become this way in the industrialized world, can it actually be stopped? I’ve met Rep. Ron Paul. I like Ron Paul. I think he could use a little education on the American Civil Rights Movement, the remarkable people who helped make it happen and the sometimes-supreme sacrifices they made. And the fact that many “good people” stood in the way and many more said “not now.” When I was a conservative, I never was able to feel worse than ambivalent about the 60s. Despite its messiness and multiple tragedies, I now think that it was an era that put America on a much better course than we had been on. Conscious decisions and actions of imperfect people during that era have given America a great legacy, and have given real meaning to saying things don’t have to be the way they are. There is such a thing as change for the better. It’s not easy, or free, but I am not ambivalent that both the United States Constitution and the American constitution are better (mostly*) following the struggles of the 1960s. I think I like President Obama. I voted for him. He was the first Democrat I ever voted for. I had and continue to have doubts about his executive ability. I had and continue to have doubts about Rep. Paul’s executive abilities. The only other candidate I would consider is Gov. Romney, who does have proven ability, but whose religion (the truly American religion of Revelation – Mormonism) will cost him something, and whose recent work history as a hedge fund CEO will surely remind plenty of voters what they [rightly] despise about our economic regime. I know something about Rep. Paul and his connections to some of the folks involved or formerly involved with a group called the League of the South – who may have been the “ghostwriters.” It would be easy, too easy, to call them racists. Instead, I would use Gov. George Wallace’s term. They are “pointy-headed intellectuals” whose arrogance and over-blown sense of grievance blind them toward what they messing with. I’m not sure I wouldn’t rather be called a racist. I don’t actually think the LoS-ers I’ve read, and the few I’ve met, are genuine racists. In fact, I’m nearly sure of that. They are, however, inflexible ideologues who appear to delight in adopting repellent in-your-face positions that, IMO, are simply just high-brow FU’s to what they perceive as the intolerant forces of political correctness. I would add this piece – just got back from a visit with the family at my dad’s. I have a niece who’s a senior in college and didn’t know what diversity training is, and she’s a Peace and Justice major. I would say it time for the anti-PCers to chill out. It’s a bad game and it’s well past time to stop. Oh Thank You MinnItMan for not giving the Anti-PCer the “racist” ticket.. Oh thank you thank you thank you master of the universe. You write: “They are, however, inflexible ideologues who appear to delight in adopting repellent in-your-face positions that, IMO, are simply just high-brow FU’s to what they perceive as the intolerant forces of political correctness. I would add this piece – just got back from a visit with the family at my dad’s. I have a niece who’s a senior in college and didn’t know what diversity training is, and she’s a Peace and Justice major. I would say it time for the anti-PCers to chill out. It’s a bad game and it’s well past time to stop.” To us anti-PCers, its not a ‘high brow” intellectual game of no importance….its not a game at all. Its serious business when you PC’ers have enacted very unlibertarian laws and have stiffled free speech. Hate Crime is flat out the wrong kind of legislation that comes from such incorrect freedom thinking. Diversity training is another that makes one roll the eyes. The worse part Political Correctness and its wide and vague definitions has been perhaps has been The New Republic’s succcessful attempt at equating the dislike of the government in Israel & its policies with being antisemitic and antisemitism generally. Talk about stiffing free speech, its been done by the “PC Thought Police”. Now not even libertarian jews from whom Ron Paul gets his inspiration dare speak out about the racist apartheid policies of by Israel –EVEN WHEN IT IS A CLEAR VIOLATION of the very PRIVATE PROPERTY INDIVIDUAL RIGHTS LIBERTARIAN PRINCIPLES that they champion. Sad, turly sad. .Ayn Rand failed and I believe Murray Rothbard and Milton Friedman and Ludwig Von Mises failed. The living libertarian Jews today all prefer to talk about something else, except maybe the great Sheldon Richman, but even he has written far to little. . .
Let it be pointed out that Ron Paul argues and always has argued that black incarceration rates are too HIGH, that this is an injustice, and that it should be ended with an end to our standing police state policies, and that Ron Paul has voted this way and introduced legislation to this effect. The evidence indicates that these offensive newsletter articles do not reflect Ron Paul’s views on race. and not to mention the ONE issue he had a change of heart on: The Death Penalty. When DNA data came back exposing the innocent blood, and of course that is innocent black blood, Ron Paul did what no one else has done, changed his position NOT BECAUSE it was politically expedite (it hurt him as a Republican). Does not sound like an action of a “racist” to me. Ron Paul is NOT a racist. Listen to all of his speeches and interviews and see if you can find anything that sounds like that which has been written in the newsletters. NOTHING about that would be called RACIST if Charles Barkley said it. Indeed, it is NOT racist at all. There is no call for LEGAL discrimination BECAUSE of SOME bad ethnic characteristic. There is no call for any Legal discrimination at all and there is no call for ANY discrimination period. Notice this statement, “If you have ever been chased by a white middle-aged cop, you know that after 50 yards you are home free”. Is THAT racist? No, again its a generality that may or may not be true, just as its a generality to say that criminal black teenagers, are very quick. Moreover, its not even a negative of the ethnic group to be fast. Notice that real non-PC racism captures real racists such as Hitler and the KKK who routinely denigrate ethnic characteristics and use those ‘faults’ as ‘reasons’ for legal discrimination. Notice how with Hitler ‘those jewish cockroaches’ are not fully human and thus legal discrimination is therefor ‘justified’? That is what racism is. That is what racist do. Those kinds of remarks are racists remarks. Hitler did it, the KKK does it, and even black waring tribes do it, But neither Charles Barkley or Ron Paul INVESTMENT Newsletter was calling for legal discrimination. nor was their ethnic characteristic disparagement. Now I know that few liberals are as brave as this one to go up against Bill OReilly and call a spade a spade without backing down or seeking some PC compromise “position”, http://www.youtube.com/watch?v=cU-XN5kuoKE&feature=share . … but I do expect that REAL liberals and progressives to champion the man who champions 1/2 THEIR CAUSES & PRINCIPLES. Indeed, if the 2012 election year vs different and the shoe was on the other foot, you better believe libertarians everywhere would be crossing party lines (what the heck are they anyway but false self image constructs that keeps people prisoners of the fraudulent 2 party system?) to vote for an ALan Grayson or Denis Kucinich. . ..